EARTH Month Clean-up @ "Whitman Woods"
Honor Mother Earth and Walt Whitman's legacy during Earth Month! Join Whitman Woods Project Outreach Coordinator Ellen Kuehner and Advisory Board Member and Arborist Stanley Wrigley of Wrigley's Tree Service to help steward the future passive park’s lakeshore and footpaths. 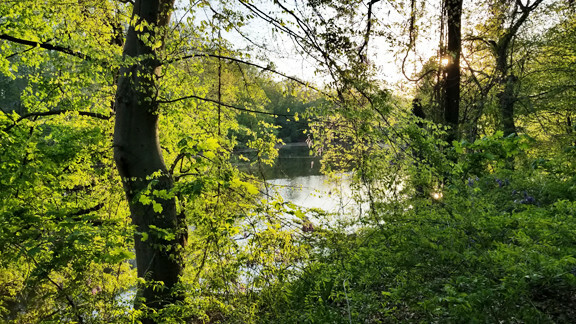 In addition to tidying up, participants can explore the aspirational "Whitman Woods" site, view the passive park's Site Plan, and channel Walt by communing with Nature along the wooded shoreline that famously inspired him. ATTIRE Garden or work gloves, long sleeves, long pants and closed-toe shoes, work/hiking boots, Wellies or old sneakers. OPTIONAL Pack a picnic and bring a camp chair. Whitman Woods Project Mission— Distill art, nature, history and science into a living land legacy that will preserve precious passive open space in perpetuity, serve as an open classroom and pay homage to the iconic American poet Walt Whitman.